UPDATE: If you are interested in the TI-84 Plus C, please check out my TI-84+C Review. I was fortunate to receive a pre-release device from TI for review purposes. After word broke last week of a possible new graphing calculator from Texas Instruments, I reached out to TI, asking if they’d be willing to make any on the record comment about the rumors. Today, I heard from Texas Instruments Digital Content Manager Dale Philbrick, who gave me the first official public comments from Texas Instruments about their new device, the TI-84+ C graphing calculator. The rumors are true, and the news is huge. Philbrick publicly confirmed that the photo that first appeared on Cemetech last week of a new TI-84+ model is authentic. Color is coming to the TI-84 family of calculators. I spend about 40 minutes talking with Philbrick about the new graphing calculator, getting answers to the questions I think educators would be most interested in. In some cases, I was able to get very specific answers. For others, Philbrick had to be somewhat vague. He stressed that the TI-84 Plus C is still “in development,” so some design decisions haven’t been finalized yet. That meant he wasn’t willing to give a lot of details on hardware specs. What’s are the differences between the TI-84+ Silver Edition and TI-84+ C? The most obvious is the display. The new TI-84+ C is a full color, backlit display, which will feature a much higher resolution than the older TI-84+ models. Philbrick wouldn’t mention a specific resolution, but TI-Planet has it at 240 x 320 px. He did confirm that it will feature a rechargeable battery pack, which is much like what the TI-Nspire uses. 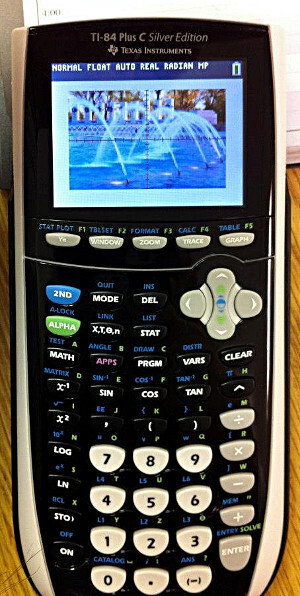 Also like the TI-Nspire, the new TI-84+ C will have the ability to load photographs and graph right onto them. Beyond that, most of what the TI-84+ C does is very similar to what the current TI-84+ models. The operating systems will look and function in much the same way. When pressing entering the “Format” or “Mode” menus, there will be additional options for the color features, but most menus will be the same, and the button layout will be identical to the current TI-84+ models. Will educators be able to function with black and white and color TI-84 models in the same classroom? For the most part, there’s no reason they couldn’t. Philbrick made clear that the development team is going to great pains to make the different models look and function as closely as possible, so students will be able to follow identical button sequences for either model. For teachers that use TI-Smartview, the software that allows you to use an LCD projector to display an emulated TI-84 to your classroom, an updated version is going to be issued. The new version will allow teachers to switch between the TI-84+ and TI-84+ C.
There’s also going to be an updated version of TI-Connect issued. This will allow the TI-84+ C to interface with the computer for app transfers, screen captures, and all the other goodies past models have enjoyed, but it will also allow the transfer of color images onto the device for graphing purposes. Unlike the TI-Nspire, the TI-84+ C won’t accept common image file types like jpg and png directly, but will require a conversion process. For classrooms that take advantage of data collection sensors, the TI-84+ C will not require any new hardware. It will be fully capable of interfacing with devices like the CBL and CBR2. There are, however, a couple of additional key differences between the old and new TI-84+ models. First, while it is possible to transfer collected data and programs between the color and black and white models, programs that rely on pixel location won’t display correctly due to the TI-84+ C’s much higher resolution. It’s also not possible to transfer apps (more on that in a minute) or operating systems (for obvious reasons) between the two. In some classrooms, the biggest difference will be that the TI-84+ C will not work with TI-Navigator. “It’s not in the cards,” said Philbrick, indicating that there are no plans to ever give the TI-84+ Navigator support. Can educators expect a renewed focus on TI-84 professional development opportunities? In a word, yes. Anyone who has recently attended one of TI’s hugely popular T3 conferences for educators knows that there has been a seismic shift in professional development towards the TI-Nspire family of calculators. Philbrick said that they have heard from some educators that are still using the TI-84+ and would like to have more opportunities for professional development. Texas Instruments has already started reaching out to some of their T3 presenters encouraging them to consider presenting on the TI-84+ C next year. What does the release calendar look like for the TI-84+ C? While Texas Instruments is far from having a specific date in mind, the TI-84+ C will be released in the Spring of 2013 with the idea that it will be widely available for back to school sales during the summer of 2013. The cost is far from a done deal, but the MSRP could be in the neighborhood of $150. The 84+ C will be released in countries around the world, though Philbrick could not confirm that it would be sold in every country where Texas Instruments currently sells the TI-84+. Apps between older models and the 84+ C are not compatible, so Texas Instruments is in the process of rewriting their most popular TI-84+ apps for the 84+ C. At the time of release, the TI-84+ C will come preloaded Finance, Inequalz, App4Math, CellSheet, EasyData, Plysmlt2, and Smartpad. Over the course of the summer of 2013, many more of the popular TI-84+ apps will be released for the 84+ C including Areaform, CabriJr, Conics, Periodic, ProbSim, SciTools, and Transfrm. What does this mean for the rest of the TI-84+ family? For now, not much. Philbrick was very clear about the TI-84+ C. “It’s not replacing anything.” Texas Instruments has no plans to discontinue either the TI-84+ Silver Edition or the standard black TI-84+. On the other hand, don’t expect a refresh for the older 84’s. Unlike when the TI-Nspire CX was released and the entire Nspire family got an update, there are currently no plans to update the TI-84+ OS from its current version, 2.55. Should TI-Nspire users read anything into the release of the TI-84+ C? I hope to have the opportunity to get an early “sneak preview” of the TI-84+ C in the coming months, much as I have for other releases such as the Casio Prizm and TI-Nspire CX. Stay tuned for that and a full fledged TI-84+ C review as the time of its release draws nearer. Color TI-84 Plus C Reported: Hoax or Fact?